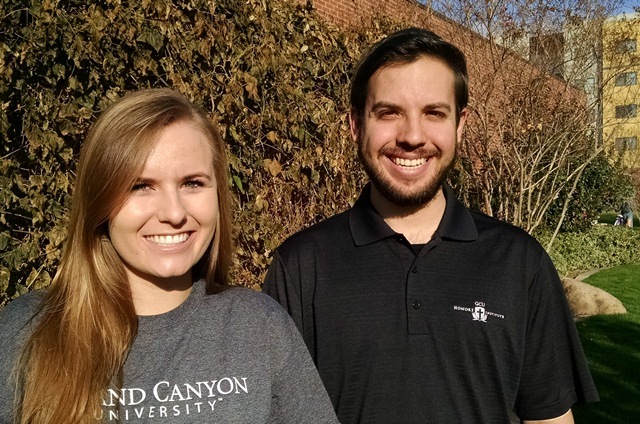 In its second year, Grand Canyon University’s Honors Institute has evolved into a close-knit academic community focused on developing deep thinkers. Honors Institute students include local Valley scholars with impeccable classroom credentials, as well as those from out-of-state and rural high schools. There are nearly 300 student members now, up from about 60 from last year, and GCU anticipates having hundreds more students in the program each semester. Breanna Boling, who oversees the Honors Institute, said nearly 120 incoming freshmen already have committed for next fall. The University’s goal is to have about 5 percent of the ground campus student population involved each year, she said. Many students are drawn to the Honors Institute’s extracurricular opportunities such as increased access to faculty mentors, exclusive academic events and career-development activities. To be admitted, incoming freshmen are required to demonstrate high school GPAs of 3.8 or higher and ACT composite scores of 27 or higher or combined scores of 1200 on the math and verbal SAT tests. Transfer students must demonstrate a 3.5 GPA or better, and all students must maintain a 3.5 GPA to remain in the program. Applying students are encouraged to demonstrate their commitment to academics, servant leadership and community involvement, since the Institute aims to prepare students beyond the classroom. “There’s an unbelievable community within the Honors Institute,” said Boling, who is organizing an educational trip to Europe this summer for members. Honors Institute students take three general education courses, including Christian Worldview 106, with other honors students only. They also take another two or three courses in their majors for honors credit. Beyond the classroom, Boling said students are exposed to “more opportunities than they know what do to with,” such as special access to guest speakers and internship information, and they are linked socially into the Honors Consortium Club. Members are required to attend annual symposia, which this year are Feb. 7 and March 28. Esther Kelley (junior, nursing) and Vince Indelicato (sophomore, business intelligence) said the GCU Honors Institute has helped them get involved on campus and grow academically. Honors Institute students receive priority consideration for some campus student worker positions and housing priority for placement with other honors students, she said. Vince Indelicato, a 20-year-old business intelligence major who’s emerged as one of the sophomore leaders in the Honors Institute, said the experience has been valuable. The Phoenix native and Washington High graduate is involved in various extracurricular activities in the Colangelo School of Business and tutors students and serves as a student liaison for the Honors Institute. Without committing to the Honors Institute, Indelicato said he might not have had some of those opportunities, including access to full-time honors faculty. The Honors Institute is one way incoming students can apply the ideals they learn in the classroom in the community right on campus — which helps develop real-world work experience to demonstrate to potential employers, he said. Junior nursing major Esther Kelley, 20, said she was drawn to the Honors Institute for the exclusivity of a “deeper education” that could take her beyond her everyday coursework. The Lincoln, Neb., resident saw the free extra support of the Honors Institute as something she couldn’t pass up while earning a nursing degree and likely applying later to graduate programs. With the transition to college life away from the stability of home, Kelley knew the Honors Institute would be another tool to help her stay focused. “Since (GCU) was growing at the rate it was, I wanted to be involved with something more intimate,” she said.